Market ignore conflicting fundamental developments. BTC/USD is rangebound, which means that the imminent breakthrough may result in a sharp movement. BTC/USD is changing hands at $3,542, unchanged both on a day-over-day basis and since the beginning of Thursday. The first digital coin has been lethargic recently, squeezed between $3,600 on the upside and $3,490 on the downside. The conflicting news only makes matter worse. While some states in the U.S. are softening their position towards cryptocurrencies – Wyoming is about to legalize Bitcoin as a means of payment, and Pennsylvania excludes digital assets from MTA – the SEC seems to remain skeptical. CBOE had to withdraw its application with the regulator, allegedly, to avoid adverse ruling. Bitcoin’s recovery is hampered by a cluster of strong technical levels. Located just above the current price, the limit Bitcoin bulls’ ability to proceed to the cherished $3,600. Bollinger Band 15-min both lower and middle lines, 38.2% Fibo retracement weekly and 61.8% Fibo retracement daily. If the price manages to claw its way through this resistance area and pass through the previous day high at $3,612, the short-term technical picture will improve slightly. The next significant resistance is located at $3,700 with Bollinger Band 1-day Middle and the highest level of the previous week making it a hard nut to crack. The ultimate short-term resistance is seen at $3,850 (Pivot point 1-week Resistance 2, and 61.8% Fibo retracement Monthly). Below the current price, the BTC/USD is supported by minor SMA levels, 23.6% Fibo retracement weekly, Bollinger Band 15-min (both lower and middle lines), Bollinger Band 4-hour lower, Pivot Point 1-day Support 2. 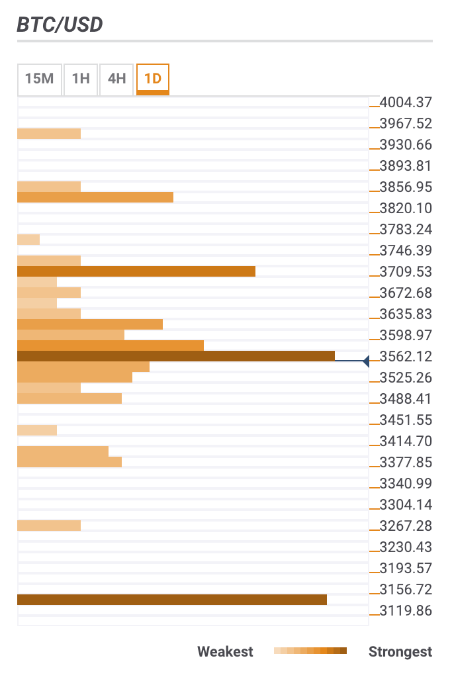 Basically, the technical levels are scattered all the way down the lowest level of the previous week at $3,480. Once it is cleared, the sell-off will continue towards interim support at $3,400 (23.6% Fibo retracement Monthly), and to the ultimate $3,126 – the lowest level of 2018.